In May 2004 I went to 'minister' to a couple of missionaries in St Etienne. How it came about was I felt God told me to e-mail them in January that year and tell them He wanted me to come over and bring some words He had given me. Needless to say they thought I was crazy and didn't reply. I e-mailed them again in April 2004 and this time told them to check me out with our minister. Not sure what he said but a couple of days later I got a phone call inviting me over. That trip was very special and helped to begin a friendship that has become very precious to us. 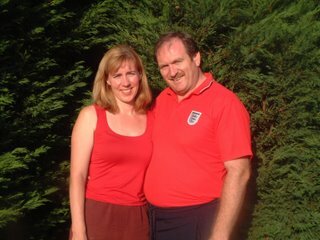 In October 2005 Mrs Prophet and I led a team to St Etienne and ministered in places. We took services, went to see Romanian squatters, prayed on windy hillsides and had lots of exciting things happen. It changed some people forever. Tomorrow Mrs Prophet and I take another team. Some of the original team are coming with a couple of new members. We also would have had Mrs Teapot but she for obvious reasons will pray at home, we will miss her, she was such an important part of the last team. This time we are going into churches, a catholic school to join their choir (should be interesting) and we'll be praying with leaders again. I have found it really hard this year, I have not really felt any enthusiasm to go which has been difficult at team preparation meetings. Last night I was getting ready to speak on Sunday and I listened to English and French worship songs. I sensed God came and sat down beside me and told me that it all would work out. English Blogger reminded me of the 'Footprints' poem (see comment on last post, Moving On). I realise that God loves to carry us when we need it. He is the reason we are going so it would be selfish of me not to allow Him to carry me and receive His great love for me. So onward we go, marching into France to take and receive. Pray that we will be used to glorify this great King whom we serve so inadequately. Go in Gods strength Graham, just by being you and offering yourself to the team and to Wayne and Wendy it will be a huge blessing. Use the time to be an empty vessel Graham, and let God fill you and mould you. You can be a leader and be where you are; just be open to God, in vulnerability is great strength. I will be praying for and the team. ....I anticpate big surprises and look forward to hearing about them. whoo your back. Hope you are getting some rest.